Researchers from the University of Utah developed a new polymer light emitting device that can be tuned to emit light of different colors, including white (without the need to mix several emitters). The new material is a polymer molecule doped with platinum. The same material can also be used to develop efficient OPVs or Spintronics-based memory devices. The device currently being developed at Utah isn't an OLEDs as it only emits light when stimulated by other light (such as a laser) and not when simulated by an electrical current. But the researchers say that a white OLED based on this technology is possible and predict that it will be developed within two years. The current device isn't actually white, it emits colored color (more on this below) and they say it will take about one year till they manage to develop a white Pt-1 device. The basic idea is to take an organic polymer and insert (dope) platinum atoms at different intervals. Different intervals result in different light colors - including white. So the same molecule can emit different colored light at the same time and thus achieve white light. The researchers created two versions of the same polymer. The Pt-1, which emits violet and yellow light as it has a platinum atom in every unit or link. The Pt-3 has a platinum atom every third unit and it emits blue and orange light. Vardeny says the new polymer also could be used in a new type of solar power cell in which the platinum would help the polymer convert sunlight to electricity more efficiently. And because the platinum-rich polymer would allow physicists to “read” the information stored in electrons’ “spins” or intrinsic angular momentum, the new polymers also have potential uses for computer memory. 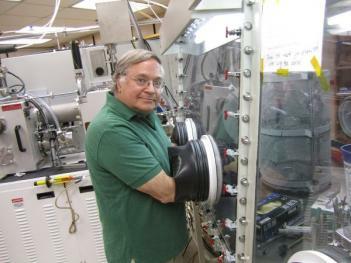 The same professor in charge of this research (Z. Valy Vardeny) was also in charge of the Spin-OLED (spin-polarized polymer efficient OLED devic) reported in 2012. Just a few hours ago we reported about a talk Professor Vardeny gave titled "Spin Effects in Organic Optoelectronic Devices" describing the Spin-OLED in more details.